This part has been discontinued, this page is for reference only. 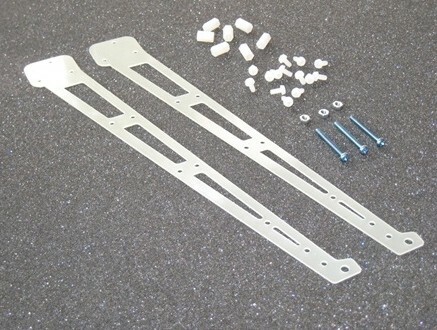 This is the high rise landing gear for ArduCopter frames Tri, Quad and Hexa multi rotor copters. These landing gear legs will give 25cm of space below the motor arms. If you are looking to use your multi rotor copter for aerial photography the high rise landing gear legs provide enough room to fit a camera mount under the main body. You can also add a mount plate for your ArduCopter frame, there are two designed to fit the Quad & Hexa copter frames which work right out of the box with the GoPro camera mount. Usage: Mount around your armtubes and lock with mount screws provided with the packet. You need to order a minimum of 3 (Tri) or 4 (Quad, Hexa) arms to have a complete landing gear.